If you already have an idea of the strategy you want to use, you can go directly to step 4. Because we want to make automatic trading more accessible, we also give you the possibility to create trading systems with no programming required. 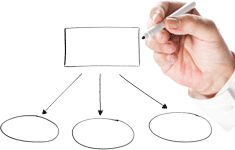 From an "initial idea", you will define the buying and selling conditions of your strategy. ProRealTime then allows you to test these buying and selling conditions before deciding to actually use them. You can then easily decide whether or not you want to continue with this idea and later improve it based on your experience. Do you have a trading method you saw in a book or on the internet that you would like to test? What are your favorite indicators among the numerous ones available to you? Do you want to take into account high and low prices in your buying and selling decisions? Should your system take into account one condition or multiple conditions? Do you want to use a trend-following strategy or a counter-trend strategy? Do you want to only take long positions or also take short positions to also benefit from downward trends? Do you want to base your market exits on conditions related to technical analysis or on money management techniques (target and protection stop orders determined based on the position entry price)? In general, a strategy starts with a simple idea which can be progressively improved. If you already invest in financial markets the best inspiration may be what already works for you when you do "manual" trading. Manual trading may be seen as permanent experimentation and automatic trading as the automatization of techniques you already successfully apply in manual trading. Many books talk about trading strategy and may suggest trading ideas or complete strategies which you can test. Once your initial idea is determined, you then need to determine the financial instruments on which you want to test your strategy. This section may give you some ideas which could be taken into account when making your choice. Liquidity: is the instrument you want to choose liquid enough that your trading system will be able to close a position at any time in good conditions? Trading hours: do you want your strategy to be able to take positions at night and as a result use instruments which quote 24 hours per day during the week? Opening gap: the more limited trading hours a market has (ex: from 9:00 to 17:35), the greater the risk of an open the following day with a significant gap between the previous closing price and the new opening price. To limit this risk, it is possible to invest in markets that quote 24 hours per day or markets with more limited closing times (ex: from 23:00 to 8:00). To avoid the risk of an opening gap, you could also plan to close any open position at least 15 minutes before the market closes. Required margin: make sure you have enough required margin to cover the position(s) of your trading system(s) plus losses which may occur (see margin examples in the table below). Minimum gain to make: certain trading systems may rely on taking frequent positions for a short time with the goal of making small gains. If using a system like this, it might be interesting to use an instrument for which the ratio of "Execution cost" (taking into account the spread and brokerage fees) to "Value of the instrument" is low. The table below includes some examples. * Calculation for Index and Forex CFDs using the minimum spread = [minimum spread / contract value] × 100. Examples based on IG CFD prices with the minimum spread on June 1st 2014. The spreads may vary and are not always equal to the minimum spread. A well planned money management strategy should allow you to maximize your gains while limiting your risk. Depending on your money management technique, a given strategy may be winning or losing for a given set of historical data. Leverage: What is the maximum leverage you do not want to go over? To limit leverage, you can either limit position size or increase portfolio value. Short selling: Do you only want to take buying positions or do you also want to take short selling positions? Keep positions overnight or close them: do you want to never be in position ("flat") before the close of the market each day to avoid the risk of an gap between the previous close and the next day's open (also called an opening gap)? Investment timeframe: do you want to use an investment timeframe of minutes, hours, days, or more long term? Time restrictions: Do you want to put time restrictions on your system, for example to not open new positions after a certain time of day close to the market close? Targets: Do you want to use a target with a fixed value that will close your positions once a certain amount of gain has been reached or would you rather close your positions based on technical analysis conditions? Protect your positions: do you want to add protection stops based on a maximum loss amount per position or based on a price level on the chart? Max position size: what is the maximum position size which you do not want to go over? Note that the maximum position size will be asked each time you start a trading system and will override the conditions in the code. Maximum number of orders: what is the maximum amount of orders you want your system to execute per day? (Ex: one round-turn per day or be more active). Note that the maximum number of orders can be set via the "Trading Options" menu. In the window that displays the desired instrument, insert and configure the indicators used by your strategy. 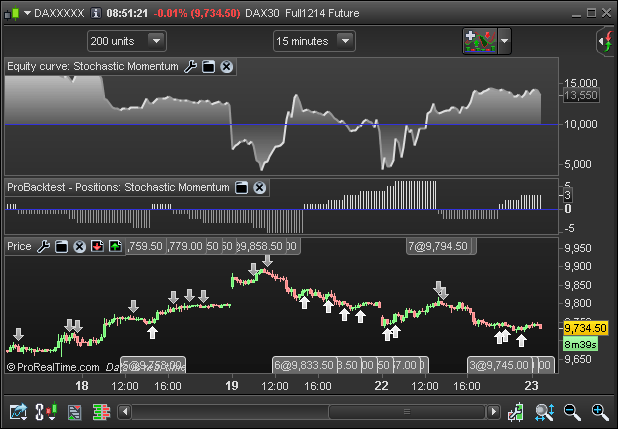 Then, click the button in the top-right of the chart and click "ProBacktest & Automatic trading" and finally, click "New". To define your buying conditions (to enter long positions), click the "Buy" button. To indicate to the platform what element your buying condition depends on, click the panel containing the element in question (ex: if your condition depends on the MACD, click on the panel containing the MACD). The window will then offer you to choose your conditions via dropdown menus. Once your condition is chosen, click "Done" if you are finished or "Add Condition" and restart the option in step 4 to define multiple conditions. Optional: you can then repeat steps 3 to 5 to also define conditions to sell your long position, conditions to enter short positions, and conditions to exit short positions. Click the "Targets & Stops" button to define your Stops, Trailing Stops, & targets. Now you just need to click the "Generate code" button. The platform will create the code based on your conditions! You can create systems by programming them yourself in ProBuilder language. 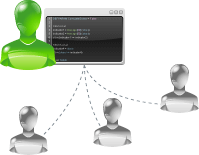 ProBuilder language (created by ProRealTime) is easy enough to allow users not used to programming to quickly create ProOrder systems. Integrated help: a menu lists all of the functions available with help texts and examples of use for each. 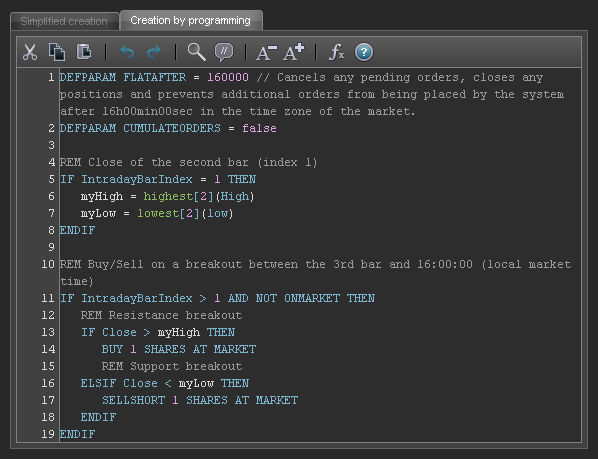 If you have a ProRealTime Trading or CFD account sponsored by ProRealTime, you can benefit from programming assistance by making a request through the dedicated form. Write to us with your conditions to enter and exit positions and your money management rules while being as precise as possible and we will try to send you a code which corresponds to your requirements. Please note that ProRealTime does not offer any investment advice. Our programming assistance consists of sending you examples of lines of code that will let you put into practice some or all of the conditions you indicate to us, without any intervention concerning the choice of these investment conditions. We offer two complementary methods to test your trading systems. The ProBacktest module lets you simulate implementation of your strategy based on historical data in order to get an estimation of what its performance could have been. As a result, the ProBacktest mode lets you confirm the performance of a system, based on the available information in the historical data, but also detect weaknesses to improve it. Backtesting your system on longer and more reliable data provides more relevant and useful results. ProRealTime offers several years of intraday historical data. The reliability of this data is maintained by a team dedicated to full-time data maintenance and a direct connection to exchanges. Display the charting window of the instrument on which you want to backtest your system in the unit of time of your choice for the simulation (ex: 15 minutes). Use the "history" dropdown menu (at the top left of the chart) to load the amount of historical data you want to use (ex: 10 000 units). At the top of the chart, click on the button then on the tab "ProBacktest & Automatic Trading" and select the system you want to backtest. 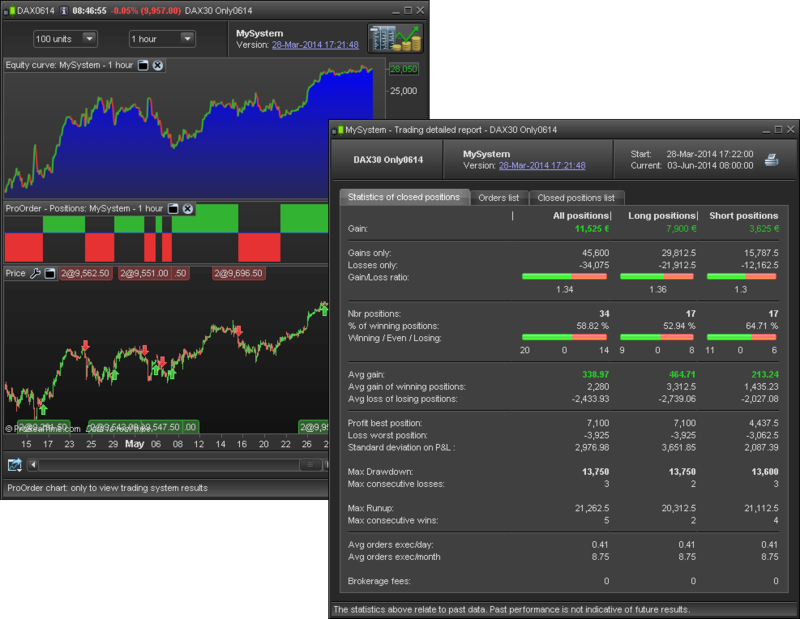 Max position size: indicate the maximum position size the trading system is not allowed to go over for the simulation. Historical data used in the simulation: by default the system will be simulated on all of the data loaded in the chart. Use this option if you want to reduce the time period to simulate the system (ex: from January 1st, 2014 to June 30th, 2014). Then you just need to click the button "ProBacktest my system" to launch the simulation. To learn more about ProBacktest, go to page 23 of the trading systems programming manual. Warning: the statics calculated with ProBacktest relate to past data. Past performance is not indicative of future results. 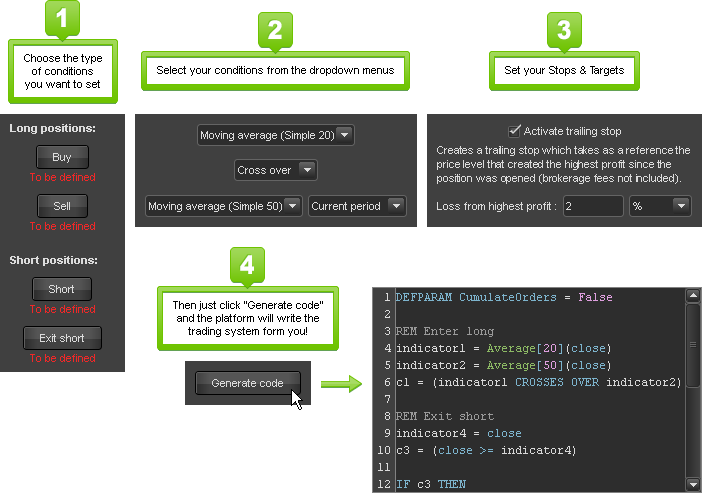 PaperTrading is a trading simulator that lets you practice trading in real market conditions with a virtual portfolio. As a result, you can also simulate execution of your trading system day after day in real market conditions with PaperTrading. It will let you see the positions taken by your trading system in real time and also test your own reactions to automatic trading situations. 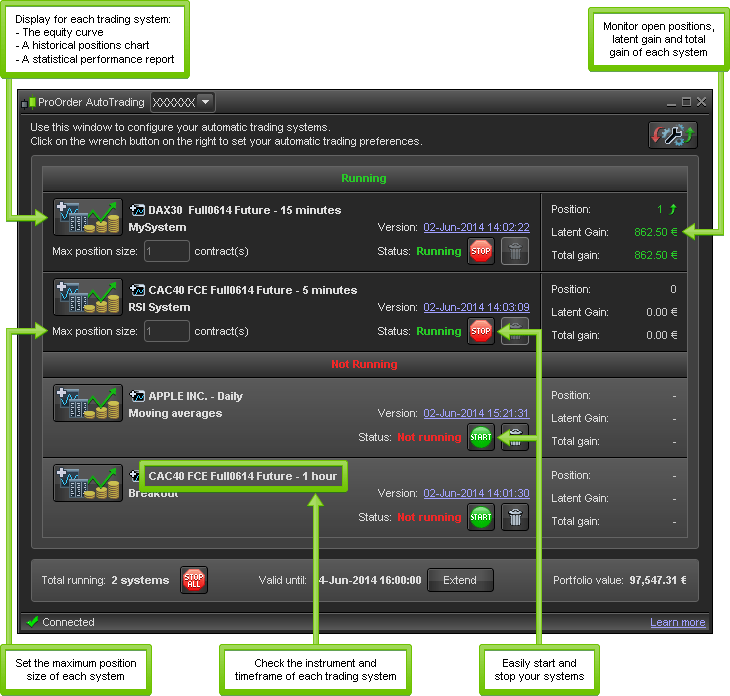 After launching your ProRealTime platform in PaperTrading mode, starting a system in PaperTrading mode is done in the same way as in real trading mode, as described in section 6 of this page. From the top of the chart, click the button, then click "ProBacktest & Automatic Trading" and select the system you want to execute. Click the button "Prepare for automatic trading" to send the system to ProOrder. The ProOrder window opens. Your system will be in the "Not Running" section of the ProOrder window. In the charting window, left-click on the "Equity curve" or the title "ProBacktest - Positions", hold the mouse button down and move the cursor to the ProOrder AutoTrading window. When you let go, the system will appear in the ProOrder window in the "Not Running" section. From the top of the ProOrder window, click on the button to set options related to ProOrder. Position and order status after stop of systems: when a system is stopped, choose if you want ProOrder to close the positions and cancel the pending orders; or keep them to manage them manually. Stop due to number of orders: choose a limit to the number of orders a system can place. Beyond this limit, the system will be stopped. Stop due to expiration date: for security reasons, all systems have a common validity date, beyond which they will be stopped. To extend the validity date, click "Extend" in the ProOrder window. The "Limit of validity" parameter lets you define the number of days of each extension. Once these options are set, click the X icon to close the options window and go back to ProOrder. In the ProOrder window, click the button of your trading system. Before starting the system, you have to define the parameter "Max position size". This is the maximum position size your strategy will be allowed to take, regardless of the conditions in the code. A new condition of your system is met and asks to buy 2 additional contract to theoretically increase the position size to 3 contracts. This condition will be ignored because you defined a "Max position size" of 2 contracts. Your system will then be displayed in the "Running" section of the ProOrder window and will blink to show it has been activated. Its "Status" will also change from "Not running" to "Running". When a ProOrder system is being executed, you can check its activity and performance in the ProOrder window of the ProRealTime software. For each trading system, you can display the equity curve showing the performance (gains and losses) of the system since its beginning. A precise analysis of the fluctuations of the equity curve can give you useful information to improve your system. For example, how to avoid some of the realized losses or reinforce positions during periods when the system is making gains. The Position history chart displays histograms showing the historical positions of your trading system. It is notably useful to see if your system is often in position and the average size of the positions. Order history is displayed on the Price chart. The orders to enter positions are shown by arrows and exit orders are shown by crosses. Both information are also available in the detailed report window in list format. 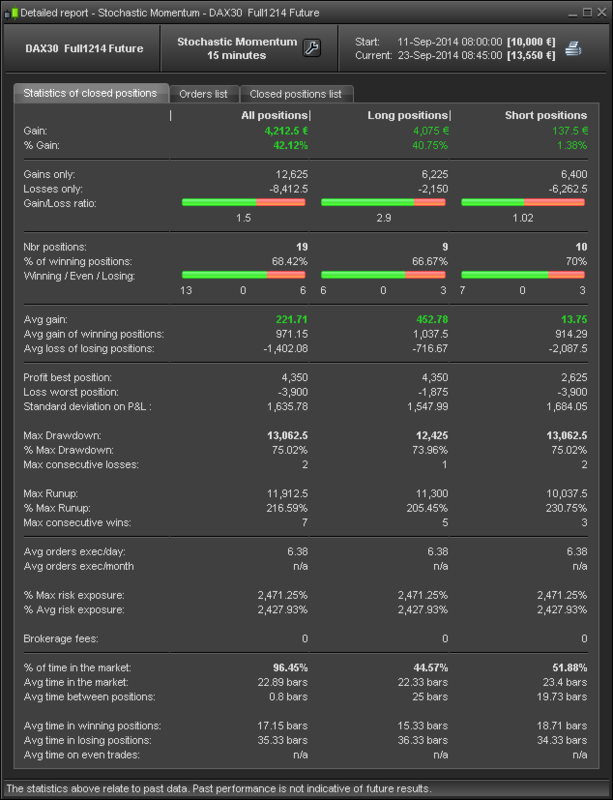 Profit analysis: Average gain per type of position (long/short), percent of winning positions, gain/loss ratio, etc. Analysis of your orders and positions: Average executed orders per day, percent of time in the market, average time between two positions, etc. Risk analysis: max drawdown, max risk exposure, average risk exposure, etc. Tip: the detailed report, order list and positions list may be easily exported to external applications such as spreadsheet applications (via drag and drop). All the information above will be helpful to you to detect weaknesses in your systems, improve and adapt them to new market conditions. Note: when you modify a trading system, the old version will remain in ProOrder (unless you remove it manually). To easily show you the difference between old and new versions, ProOrder displays a version number (which corresponds to the date & time you sent the trading system to ProOrder). Once you are familiar with the basics of the ProOrder module, we recommend that you also read the programming manuals which we carefully wrote for you to be able to program yourself with more independence. When you improve your system, the ProBacktest and ProOrder modules will be your best partners to confirm your changes via simulation. Would you like to share one of your systems with a friend? From the "ProBacktest and Automatic Trading" window, select the system you want to share and then click "Export". In the next window, select "None, code will be fully editable", then click "Export". Your trading system will be exported as a ".itf" file. You now just need to e-mail this file to the person of your choice who will be able to easily import it to their ProRealTime platform! Did you download a ".itf" file from an Internet site or forum? Did a friend send you a trading system he created? From the "ProBacktest and Automatic Trading" window, click the "Import" button. From the window that opens, select the .itf file from your computer, then validate to import it to your platform. The system will now appear in the list of system, in the window "ProBacktest and Automatic Trading". Check that the system is adapted to your situation and adapt it if necessary for your own needs. Never use a trading system from a third party without first testing it and adapting it if necessary. Note: to execute a trading system imported to ProOrder with a real portfolio, its code must be accessible (and modifiable). However, backtesting is possible in any case.